NASHVILLE, Tenn. (AP) Titans rookie wide receiver Corey Davis insists he’s ready. Finally. And no, the fifth pick overall in the April draft is not rushing back from a hamstring injury. He’s already done that once this season, and that was enough. The first wide receiver drafted this year finally returned to practice Monday after aggravating his hamstring Sept. 17 in a 37-16 win at Jacksonville . The rookie might’ve returned a bit earlier if not for the Titans (4-3) sitting out Week 8 for their bye, a schedule that made it easier to keep Davis out a few days more for insurance. ”I got real fresh legs, real fresh legs,” Davis said. The Titans could use the 6-foot-3 Davis, who was drafted out of Western Michigan to give quarterback Marcus Mariota a big target. Tennessee ranks 26th in passing, averaging 201.9 yards per game, and tries to remain atop the AFC South when it hosts Baltimore (4-4) on Sunday. Davis, the highest wide receiver ever drafted by this franchise , was inserted as a starter the first time he was healthy in June following ankle surgery after his college career ended. He initially hurt his hamstring the first week of training camp and missed the preseason . 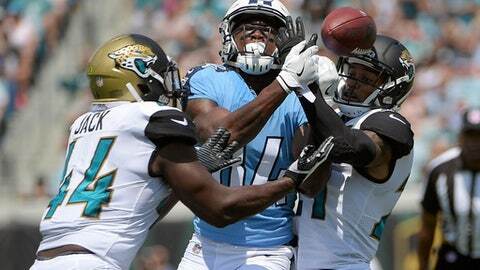 He debuted in the season opener with six catches for 69 yards, then aggravated the hamstring in Jacksonville. Titans coach Mike Mularkey said they limited Davis on Monday and he has a good chance to play Sunday. The plan is to increase his workload each day this week. The coach knows Davis is eager to return to the field. Eric Decker, the veteran signed in June after being cut by the New York Jets, has started four of seven games. Rishard Matthews leads the Titans with 393 yards receiving, and he said he expects to be helped a lot by Davis’ return. Davis set a Football Bowl Subdivision record with 5,285 yards receiving in his career at Western Michigan, and he also was an All-American last year with 97 catches for 1,500 yards receiving and 19 touchdowns. His first NFL catch was a leaping grab for 23 yards on third-and-8. He can’t wait to turn all the mental work of the past six weeks into actual plays on the field. ”It’s been a long time coming,” Davis said. NOTES: Mularkey said Mariota, who missed six quarters with a hamstring strain that limited him in the two games before the bye, is recovered from that injury. TE Delanie Walker (right ankle) and LG Quinton Spain (turf toe) did not practice. Safety Johnathan Cyprien, who hurt his hamstring in the opener, also returned to practice and was limited. RB DeMarco Murray (shoulder, hamstring) was limited.